A typographical thriller? Who would have thought. And from the hands of a 32-year-old “media inventor” and former Twitter manager who by all rights shouldn’t care a whit for paper and ink. But he does! 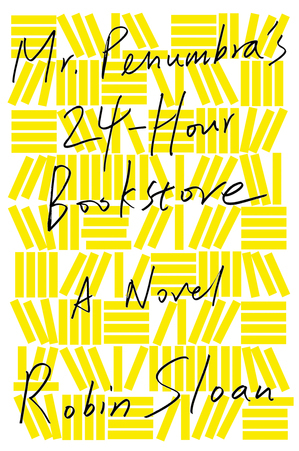 Robin Sloan’s new novel, Mr. Penumbra’s 24-Hour Bookstore (FSG, $25), is a buoyant tale of black-robed bibliophiles and Google code-breakers. The novel’s main character, Clay Jannon, takes a job at a San Francisco bookshop where, he discovers, the real business is a lending library of leather-bound books for a crew of odd readers. Once he begins snooping around a bit and applying his techie skills--hacking, data visualization--to the mystery, he discovers that his boss, Mr. Penumbra, is a disenchanted leader in a “bibliophile cult” called the Unbroken Spine. Following Penumbra to New York City, Jannon finds the object of the Unbroken Spine’s desire: a codex vitae printed by Aldus Manutius (founder of the cult) in a typeface called Gerritszoon at the end of the fifteenth century. The problem is, the book is in code; Jannon and his Silicon Valley friends aim to break it open and free the text, as it were. At 288 pages, it is difficult to escape the feeling--especially when the flap copy compares it to “young Umberto Eco”--that the novel lacks depth, and the main plot feels formulaic at times. After all, we do find ourselves in a subterranean library vault pouring over an antiquarian book said to contain the key to immortality. But Sloan is very bright, and that shines through -- even to his glow-in-the-dark dust jacket. Plus, if he entices even a handful of younger readers to the coolness of rare books, well then, all is forgiven. Incidentally, Sloan was pictured in the New York Times last month hiding away in the Grolier Club stacks, where he poured over Aldines, printed by the real Aldus Manutius. A typographical thriller? Who would have thought. And from the hands of a 32-year-old "media inventor" and former Twitter manager who by all rights shouldn't care a whit for paper and ink. But he does! Robin Sloan's new novel, Mr. Penumbra's 24-Hour Bookstore (FSG, $25), is a buoyant tale of black-robed bibliophiles and Google code-breakers. The novel's main character, Clay Jannon, takes a job at a San Francisco bookshop where, he discovers, the real business is a lending library of leather-bound books for a crew of odd readers. Once he begins snooping around a bit and applying his techie skills--hacking, data visualization--to the mystery, he discovers that his boss, Mr. Penumbra, is a disenchanted leader in a "bibliophile cult" called the Unbroken Spine. Following Penumbra to New York City, Jannon finds the object of the Unbroken Spine's desire: a codex vitae printed by Aldus Manutius (founder of the cult) in a typeface called Gerritszoon at the end of the fifteenth century. The problem is, the book is in code; Jannon and his Silicon Valley friends aim to break it open and free the text, as it were. At 288 pages, it is difficult to escape the feeling--especially when the flap copy compares it to "young Umberto Eco"--that the novel lacks depth, and the main plot feels formulaic at times. After all, we do find ourselves in a subterranean library vault pouring over an antiquarian book said to contain the key to immortality. But Sloan is very bright, and that shines through -- even to his glow-in-the-dark dust jacket. Plus, if he entices even a handful of younger readers to the coolness of rare books, well then, all is forgiven.